I think it's on the second part, lower center. Red container under the white pole. The final point is really awesome, but it's a bit... troubled. When the cart starts rolling down, 90% of the team starts camping in their bases and the remaining few hopelessly try to sneak past the impenetrable Sentries of the other team. I think the main problem is with the carts' speed - they should roll much faster, so it will be harder to defend them. 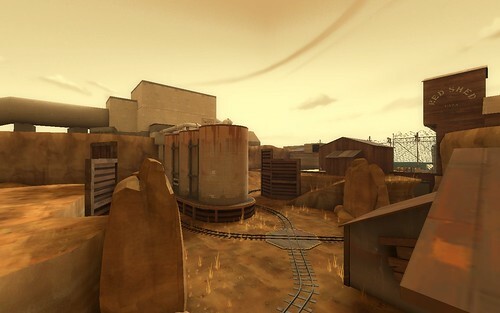 Actually, I liked this map. The first stage I think needs widening, it's a bit spammy and generally tight. It's a nice idea, having a figure of eight, and finishing it the enemy's base. The second point needs work. I liked the centre stage, but once the cart entered the enemy base it becomes really difficult. I think the track goes too close to the enemy spawn. 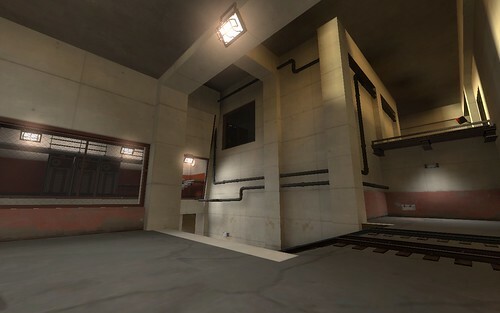 I also think there needs to be more exits in the spawns, as being killed by a passing pyro as you exit is no fun. Finally, the last section with the self-pushing cart really should be relegated to a capping animation. Standing in front of the cart to stop it moving is no fun, and it allowed a pile of sentries to be built by the cart. Overall, it's a good start, but it definitely needs work. Got a chance to play this last night. It was a lot of fun. It is actually the highest rated PLR map on our server right now. The last hill with the breakpads works well. I love standing behind the cart in PL maps (no one ever sees you there) and it kind of forces the team to defend since the cart moves forward on its own. I don't remember anything nagative about the map but we grabbed a few demos last night. Let me know when you update because I am definately looking forward to it. Now I am finished exams hopefully I will have some more time to get the gameplay right and then start detailing. I love stage 1 and 2 as they are fast, intense and definitely plays very well. My only qualm with stage 3 is that spawns seems rather easily campable, both exits are basically next to the enemy's tracks. There is a balcony where you can jump onto and then get out of the setup gates. So you can starts killing before the setup ends. 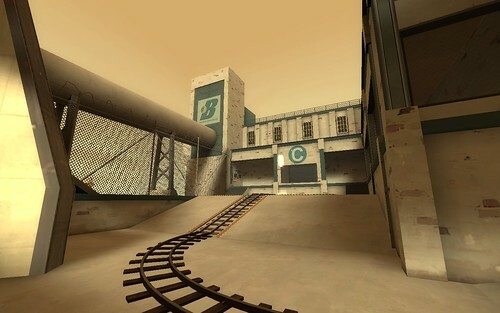 It's an alright map. Didn't get to play much of it because I had to leave, but I got one screenshot in. As fear said, the platform in the setup area's allow you to get outside the setup gates. I could get up there as scout, soldier and demo all within setup time and get to the enemy setup area within setup as well.